In a previous post, I suggested that Cuba might be able to leap over 4G to 5G wireless infrastructure using satellite and terrestrial networks for backhaul. While that would require political and policy change, it would be a good fit with Cuban culture and skills. Before talking about Cuba, let me say a bit about wireless generations. Fifth-generation wireless will be much faster than today's 4G, and latency will be on the order of 1 ms within the 5G network. Radios will be capable of beamforming — rapidly switching focused beams among large numbers of devices — and simultaneous two-way (full duplex) transmission at a given frequency. This will enable real-time applications like control of autonomous vehicles, remote medical procedures and augmented and virtual reality as well as fast file transfer and streaming and other, un-imagined applications. Do not think of this as the evolution of the cell-phone network; think of it as a discontinuity in wireless communication to mobile and fixed users. In addition to enabling new applications, each mobile computing generation uses different frequency bands, and 5G is being designed to use very high frequencies. High-frequency radio waves enable high-speed transmission and small antennas. Being able to fit multiple small, cooperating antennas in a phone or other device (multiple inputs and outputs (MIMO) increases transmission range and speed. However, there is a high-frequency tradeoff — low-frequency waves travel farther and are better able to penetrate obstacles like buildings and trees than high-frequency waves. 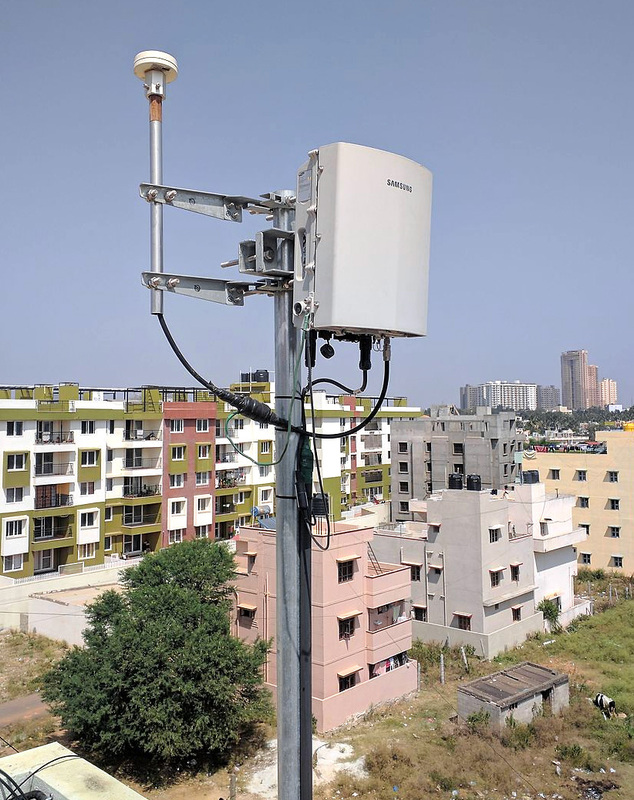 Small cell on the terrace of a building in BangaloreHigh-frequency networks will require a multi-tier architecture. With the current cellular network, phones and other devices communicate with a relatively distant base station that is connected by fiber or high-speed wireless to the Internet. Fifth-generation wireless will require many "small cell" radios that communicate with those high-capacity base stations. Now back to Cuba (and other developing nations). As of last year, there were 879 cellular base stations in Cuba, 358 of which had been upgraded to support 3G communication. As of 2016, 85.3% of the population was covered by 2G cellular and 47% of the population had 3G coverage. (Note that 2G coverage has barely increased since 2010 and it has been flat since 2012). If they continue rolling out 3G, it should reach the 85.3% fairly soon, but new base stations will have to be added to cover the entire population. Upgrading from 2G to 3G requires new equipment and also more backhaul capacity between a base station and the Internet because 3G transmission speeds are greater than 2G and 3G applications use more data. For most Cubans, it would also require the purchase of a new phone. High-speed, 5G service would require much more backhaul capacity and new phones. In densely populated areas it will be economically feasible to provide that backhaul using fiber, but fiber to support 5G capacity throughout the island would be very expensive. In many locations, satellite connectivity may turn out to be a better backhaul medium than fiber. SES Networks (O3b) will be offering connectivity using their middle-Earth orbit satellites before Cuba is ready for 5G and by the time they are ready, low-Earth orbit satellite connectivity from vendors like OneWeb and SpaceX Starlink will be available. But what about the large number of small-cell radios that will be feeding 5G base stations? Like today's WiFi radios, they will be installed and maintained by community members and users. Cubans are known for do-it-yourslef innovation, for example in keeping old cars running and installing motors on bicycles and they have built community networks in places like Gaspar, Camagüey and Pinar del Río. Havana's SNET, is said to be the largest community network in the world that is not connected to the global Internet and there are over over 1,400 active, self-employed programmers in Cuba. Small cell radios will be semi-automatically configured and simpler to install and maintain than the WiFi radios used in today's street nets, but that is the easy part. Decentralized technology calls for decentralized decision making. Local people who are locally elected should decide questions like how many small cells to deploy in a neighborhood or rural area, where they should be located and how to pay for them. Would the current municipal electoral districts (from 200-3,000 inhabitants) be an appropriate locus of network control? ETECSA would cede local control but be responsible for acquiring international bandwidth and providing backhaul over fiber or satellite from their base stations. They would also serve as consultants to local communities and could negotiate high-volume discount purchases of locally-owned equipment. Note that I am still assuming a major role for ETECSA in spite of the fact that historically, nations like Cuba have privatized telecommunication and licensed foreign operators in exchange for investment in infrastructure. In previous posts I have suggested that vested interest and bureaucracy at ETECSA and uncertainty over control may be stifling Cuban Internet expansion. To the extent that that is the case, the new administration would have to change the organizational culture to focus on Cuba's stated economic and social policy goals — leapfrogging current regulation and policy along with the technology. That may be wishful thinking, but if they are able to do so, they will have an advantage over nations in which private company profit trumps (no pun intended) social goals. The technology is also ill-defined and unproven. While the standard for the first version of the 5G radio interface between a device and base station is complete, other hardware and software standards are still being developed, and 5G is based on technologies that have been tested in trials, but not in large scale practice. The first deployments are not expected until next year, user and network equipment prices are not set and competing technologies like Starry may impact pricing and deployment. Local Time: Thursday, April 18, 2019 10:03 AM PDT – Page Load: 0.3048 Sec.